Random House Trade Paperbacks, 9780812966251, 336pp. In this commanding big-picture analysis of what went wrong in corporate America, Alex Berenson, a top financial investigative reporter for The New York Times, examines the common thread connecting Enron, Worldcom, Halliburton, Computer Associates, Tyco, and other recent corporate scandals: the cult of the number. Every three months, 14,000 publicly traded companies report sales and profits to their shareholders. Nothing is more important in these quarterly announcements than earnings per share, the lodestar that investors—and these days, that’s most of us—use to judge the health of corporate America. earnings per share is the number for which all other numbers are sacrificed. It is the distilled truth of a company’s health. Too bad it’s often a lie. 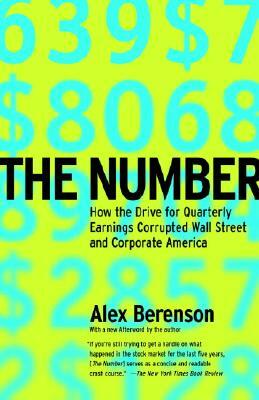 Alex Berenson’s The Number provides a comprehensiv, brutally factual overview of how Wall Street and corporate America lost their way during the great bull market that began in 1982. With wit and a broad historical perspective, Berenson puts recent corporate accounting (or accountability) disasters in their proper context. He explains how the wheels came off the wagon, giving readers the information and analysis they need to understand Enron, Tyco, WorldCom, Halliburton, and the rest of the corporate calamities of our times. Alex Berenson graduated from Yale University in 1994, with degrees in history and economics. After working at The Denver Post and TheStreet.com, he joined The New York Times in 1999 as a business reporter specializing in financial investigative reporting. He has three times been named one of the top thirty business reporters under the age of thirty. He lives in New York City.